The announcer asked, “To whom should I make out the card for the dozen roses?”, The boyfriend replies, “To My Shmookums Betsy, I love you alw…” “Who is Shmookums?” interrupts Sharon, his girlfriend who suspected an affair and used the radio station to organize a sting. Many of you have probably heard such radio programs, men and women caught in their unfaithfulness on the air. In the couple of times I have happen to have the radio on during one of these “Love Traps”, I am always surprised by the reaction of the person caught. Typically, they start by lying “Sometimes I call my mom shmookums”. I mean not only is that a bad lie, but isn’t that even worse to admit? Then they move to blame casting, “You’re smothering me, you don’t even trust me!”, which given the result seems altogether justified. We might think this only applies to these extreme cases, but I think this same thing happens in the corporate world. Many managers act like transparent cowards. When they are told they must direct their team in a way they know their team will dislike, they blame their management rather than take responsibility for it. When their team doesn’t perform or comes under scrutiny from management, they blame the members in their team. This was one of the more difficult and most important lessons a mentor taught me: Opaque management is critical. To your team, you represent management of whom you are a part. To your management, you are responsible for everything that goes on in your team. 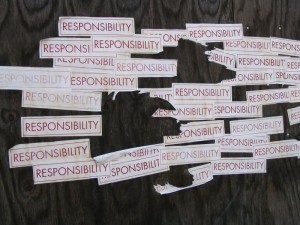 Responsibility is a fleeting skill from our increasingly narcissistic society and it is so needed. Even though it’s hard at times, we need to be responsible for our actions and be willing to take actions that we are willing to be responsible for regardless of the outcome.